Composer, computer performer and teacher – specialized in computer music. Associate professor of new technologies applied to composition at the Superior National Conservatory of Music in Paris. After earning his B.A. degree in composition and electroacoustics from San José State University in California with Allen Strange, he founded Studio Césaré in Reims with Christian Sebille, realized musical environements for composers at IRCAM as an assistant musical and participated in mumerous musical experiences as a composer or performer, his works being commissioned and supported by various studios and organisations such as La Muse en Circuit, Le Cirm, Césaré, La Grande Fabrique, le G.E.P.S (Rennes) and Radio France. 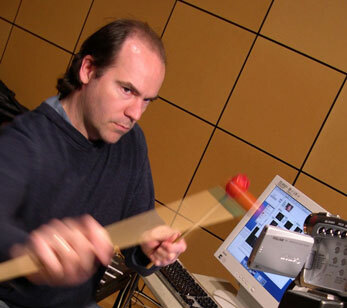 He is especially interested in instrumental performance of real-time computer systems for both written and improvised music, as well as in interaction between music and video.